If you are at risk of being sued for an unpaid debt or you are already facing a lawsuit filed by a debt collector, you need to know your rights and options. Federal and state laws regulate what collectors can and can’t do. In some cases, these laws even can lead to a debt collection case being dismissed or settled in your favor. Where to file a complaint if your rights have been violated. This guide is for general informational purposes only and not for the purpose of providing legal advice. It is highly recommended that you contact a qualified attorney experienced in the laws of your state to obtain advice about local court procedures and particular issues pertaining to your own situation. 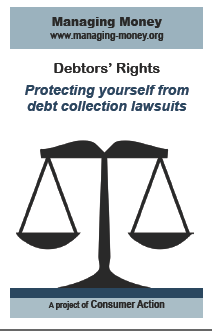 All U.S. consumers have equal rights under federal laws governing debt collection. Most states also have their own laws on debt collection. These are often the same as the federal protections, but some states provide additional or stronger protections. The main federal law that governs how collectors can do business is the Fair Debt Collection Practices Act (FDCPA). Enforced by the Federal Trade Commission (FTC) and the Consumer Financial Protection Bureau (CFPB), this law prohibits debt collectors from using unfair, abusive or deceptive tactics when collecting debts. Under the law, debt collectors must do certain things (for example, send written notification of the debt and cease collection efforts until they’ve mailed requested verification of the debt), can do certain things (contact you at work unless you tell them not to, for example) and cannot do certain things (like call you at certain hours, contact you at times or places you tell them are inconvenient or say they will take legal action against you if they can’t or won’t). The FDCPA applies only to debt collectors. This includes collection agencies working on behalf of a creditor, lawyers who regularly collect debts, and companies that buy delinquent debts and try to collect them (debt buyers). It generally doesn’t apply to the original creditor (the company from whom you borrowed the money). It covers the collection of mortgages, credit cards, medical debts, and other debts mainly for personal, family or household purposes. It doesn’t apply to business-related debts. The FTC has boiled down the FDCPA to its essential points in a free and easy-to-read article you can access online. Consumer Action also offers a concise guide to the FDCPA. Most states have their own laws that govern debt collection practices, and some may be even stronger than the federal FDCPA. For example, California’s Fair Debt Collection Practices Act covers more types of collectors, including original creditors collecting debts on their own behalf. You can find your state’s fair debt collection laws, if any, at the Nolo website and the Privacy Rights Clearinghouse website. You also can contact your state attorney general’s office to learn more about the laws in your state. State law also determines the statute of limitations (deadline for legal action) on different types of debt. A debt becomes “time-barred” when the statute of limitations runs out—in other words, the collector did not sue you before the deadline. Once the collector misses that deadline, it no longer has the right to sue you for payment. That doesn’t mean you don’t owe the debt or that the collector has to stop trying to get you to pay. (Under the FDCPA, however, you can send a letter to the collector demanding it stop contacting you.) If the collector has reported the debt to credit bureaus, it also doesn’t mean that the unpaid debt will be removed from your credit report. Derogatory (negative) information is allowed to remain on your credit report for seven years; a personal bankruptcy for 10 years. Learn more in the FTC’s fact sheet "Time-Barred Debts." You can check your state’s statutes of limitations on the Bankrate website or at Nolo.com. Learn about how the statute of limitations is calculated (in other words, when the clock starts ticking) and in what cases it might be suspended in Nolo’s “Calculating the Statute of Limitations." Keep in mind that these deadlines do not apply to federal or state tax bills, federally guaranteed student loans or spousal or child support. Most states impose a cap on interest rates—a “usury law” that prohibits lenders from charging exorbitant interest rates. If a loan exceeds the state’s maximum allowed interest rate, the lender could be fined, a portion of the finance charges could be erased or the contract could be deemed unenforceable. You can find a list of state rate limits at LendingKarma.com. Unfortunately, usury laws do not apply to certain types of debt (business loans, for example) or to banks, savings and loans, or credit unions—and, therefore, credit cards. Under federal law, these lenders are allowed to charge interest rates and fees greater than those permitted under applicable state law. Whether a debt buyer (a collector that buys unpaid debts for a fraction of the balance due and tries to collect on them) can continue to charge an interest rate that exceeds the state’s usury cap after it purchases the debt from a bank or other exempt lender is another question. It is best to contact an attorney for information and advice on this. To protect your privacy, a collector who contacts you by phone must verify your identity before revealing information about your debt. Once they have confirmed that you are the right person, they should tell you the purpose of the call and the fact that they are a collector. If asked, the collector must give you the company’s name, address, phone number and website address. If you have doubts about the legitimacy of the call, or you do not want to verify your identity by phone, you can tell the collector that you want written notice of the debt sent to the address it has on record before you will discuss it. Within five days of first contacting you, the collector must send you a written “validation notice.” This document contains information about the debt, including the amount, fees and interest accrued, and the name of the creditor. It also contains an explanation of your consumer rights, including the right to dispute the debt. If debt collectors do not send you this validation notice within five days but continue to pursue you for the debt, they have violated the FDCPA and you have the right to sue them. The debt is the result of identity theft. You have been mistaken for someone else. It is a medical debt that should have been paid by an insurance company, Medicaid or Medicare, etc. You don’t agree with the amount of the debt. The debt is much larger than what you really owe due to high fees and penalty interest that has been added by the collector. You have already paid or settled the debt. While many collection efforts begin with a phone call, not all do. You have the same rights when the collector’s initial contact is in writing. If you receive a collection letter in the mail, read it carefully. Unless you have reason to believe the letter is a fake, you should respond. Do not ignore collection letters! Learn more at the CFPB’s "Are there laws that limit what debt collectors can say or do?" webpage and in Consumer Action’s "When a collector calls: An insider’s guide to responding to debt collectors." Always keep copies and proof of your communications with the collector. Acceptable proof can be email responses, fax confirmations or return receipts for certified mail. While many debt collection calls are legitimate, many are scams by imposters attempting to collect on “zombie” or “phantom” debts—debts that don't exist because they are paid off, discharged, forgiven, time-barred (beyond the statute of limitations) or entirely made up. Victims often pay up out of fear that they might actually owe the debt and will suffer serious consequences for not paying. Or, the scammer seeks personal information that can be used to commit identity theft. The caller isn’t able to provide your name, address and the last four digits of your Social Security number. The caller requests your full Social Security number, complete birthdate or other sensitive personal information. The caller refuses to provide information about the collection agency or the debt. You don’t recognize the debt. The caller claims to be from a government agency, such as the IRS, and tells you to wire money or put money on a reloadable prepaid card and provide the code (a government agency will never ask you to do this). The caller harasses you, threatens you with arrest, uses profanity or refuses to let you speak to a manager. The caller says you must pay up immediately, or else. The caller does not send you a written validation notice. Just because you don’t recognize the name of the company doesn’t mean it’s a scam. Debts are sometimes legally sold, customer service providers change (especially for mortgages and student loans) and companies (especially banks) are bought by other companies. Also, debt collectors often go by different corporate names in the states they are licensed in because their own company names are too similar to businesses already licensed in that state. Refuse to discuss (or pay) the debt until you receive a written notice about the debt and the collection agency. Do not provide sensitive personal or financial information, such as your bank account, credit card or Social Security number. If the caller claims to be from a government agency, look up the official number for the collection company and call to confirm. Don’t assume a call is coming from the number displayed on your caller ID—scammers use technology to disguise themselves. If you think the debt might be legitimate, contact the original creditor to confirm it has transferred or sold your debt to the collection agency that called you. During all your communications, stay calm and respectful—the discussion is more likely to go in your favor. It is a violation of the FDCPA for the collector to use abusive language or profanity; you shouldn’t either. Keep detailed notes of all your communications with the collector, including date, time and content of the discussion. This will help you recall what was discussed and will serve as a record if the collector does anything to violate the FDCPA. Another important right for all consumers is the right to get your credit report from each of the three major credit bureaus (Equifax, Experian and TransUnion) for free every 12 months at AnnualCreditReport.com. This can be helpful in determining what debts you owe and their status. Not all collectors report debts to the credit bureaus, but it pays to check. You can glean a lot from your credit report, including, in some cases, who the original creditor was, when the debt was transferred or sold to a collector, what the current balance is, when the last payment was, etc. If the debt does not appear on your credit report, it could still be legitimate, but you should get proof of that. If you have disputed the debt, the collector is not allowed to report it to a credit reporting agency unless and until it verifies the debt. If it has already been reported, the collector has to notify the credit reporting agencies that the debt has been disputed. After verifying the debt, the debt collector can report it, but only as a “disputed” debt. It is a violation of the FDCPA and the Fair Credit Reporting Act (FCRA) for a collector to report a debt that it knows, or should know, is false. If you are sued by a debt collector, you will be served with an order to appear in court (summons). At this point, it’s highly recommended that you consult with an attorney. If you do have income or financial assets that a court could order be taken to satisfy the debt, you might be better off working out a voluntary repayment plan or a settlement. A settlement means you would pay less than the full balance but the debt would be considered paid in full. But again, this is a crucial decision that is better made with the counsel of an experienced credit counseling agency or a debt collection attorney. When trying to negotiate a settlement or repayment plan, it helps to know whether you are dealing with a collector working on behalf of the original creditor or a “debt buyer,” who purchases unpaid debts for pennies on the dollar and then keeps whatever payment they are able to collect. Debt buyers sometimes are more flexible when it comes to accepting lower payments or settling for a smaller percentage of the original debt. One way to know if you are dealing with a debt buyer is that on your credit report your original creditor shows a $0 balance owed to them—this means your account was sold. (Despite the $0 balance to the creditor, your credit report will still reflect a “charge-off.”) You also can ask the creditor if it sold your account. Or you can research the company trying to collect from you online to find out if it is a third-party collector or a debt buyer. ACA International, an association of collectors, provides tools and information for consumers at its “Ask Doctor Debt” website. Before offering a settlement or repayment plan, analyze your finances to make sure that whatever you propose fits your budget. The collector might be quicker to sue you if you miss agreed-upon payments. A good way to figure out what you can afford is to consult with a non-profit credit counseling agency. A credit counselor can go over your budget and help you determine what, if anything, you can manage to pay. Credit counselors also can provide useful information about dealing with specific debt collection issues. In addition to providing general information and budgeting assistance, credit counseling agencies also offer something called a debt management plan (DMP), under which your monthly unsecured debt payments would be consolidated into a single payment that you make to the agency. The agency would then disburse the funds to your creditors. There typically is a fee for this (up to $50/month), but some agencies will waive it if your income is low. The benefit of the DMP to consumers is the potentially reduced monthly payments, reduced interest rates, waived fees and agreement to hold off on legal action that the credit counseling agency can often (not always) obtain on its clients’ behalf. Many creditors and some collectors accept DMP payments, and typically agree to hold off on legal action as long as they receive the promised monthly amount. But be aware that missing even a single payment could be enough for them to initiate a lawsuit against you. Find a non-profit credit counseling agency at the National Foundation for Credit Counseling (NFCC) website or by calling 800-388-2227. If you do come to an agreement with the collector, ask for it to be put in writing, on the collector’s letterhead, and a copy sent to you. It should mention the name of the original creditor. Do not make any payment until you receive the agreement. And do not give the collector permission to access your bank account, either through automated debits or by providing your debit card number—once the money comes out of your account, it will be difficult or impossible to get back, even if you believe the collector took too much or took it on the wrong date. Send payments by check, or initiate electronic payments using your bank’s online bill pay function. Visit Nolo’s “Debt Settlement & Negotiation with Creditors” webpage to link to a number of articles that will prepare you to discuss your repayment options with a creditor or debt collector. Some tips offered include hinting at the possibility of bankruptcy, and starting very low (around 15 percent of the balance), with the aim of settling for 50 percent or less. It also helps to gather some cash before starting negotiations because you typically can get a lower settlement if you can transfer the funds immediately. Be aware that making any payment or even promising to make a payment on a time-barred debt could reset the statute of limitations. Nolo cautions against accidentally waiving, extending or reviving the statue of limitations. If your debt is too large to pay and you don’t see any way out, filing for bankruptcy could be an option to consider—either before or after you are sued. A collector cannot continue collecting on an account while the court is considering the bankruptcy case, and it cannot try to collect on a debt that has been discharged (eliminated) in bankruptcy. The fear of losing the ability to collect any part of a debt because of bankruptcy sometimes makes collectors more amenable to repayment plans or settlement proposals. Though there is a lot of “do-it-yourself” bankruptcy information available, don’t try to file bankruptcy without a lawyer. A mistake could result in a debt not getting discharged, which means you would still be required to pay it. Consumer Action offers a general guide to personal bankruptcy, which includes resources for finding a bankruptcy attorney. This guide offers general information, not advice. If you are sued, we urge you to seek the advice of an attorney, as you easily could overlook technical aspects of the case and lose important rights. If you ignore a court action, there’s a possibility that a “default” judgment will be entered against you for the amount the creditor or debt collector claims you owe. A court also may award the collector additional money to cover its collection and/or legal costs. A judgment gives the debt collector stronger tools to collect the money you owe, such as garnishment of your wages or seizure of money in your bank account. This is one reason why it is so important to speak to an attorney before responding to a lawsuit. If you dispute the debt or the amount owed, do it before the court makes a judgment. A judgment is a court order, and only the court can change it. It's very difficult to get a judgment changed or set aside once the case is over. While you may have options to have the default judgment “vacated” (voided) for certain reasons, you are much better off avoiding a judgment than trying to fight one after the case has been decided. Active duty servicemembers have some important added protections against default judgments and garnishments under the Servicemembers Civil Relief Act (SCRA). Learn more at Military.com and SaveAndInvest.org. Servicemembers being sued should consult their local JAG office. Some collectors file lawsuits knowing that they don’t have enough evidence to prove the defendant owes the debt. Because few people respond to the notice of a lawsuit—a potentially big mistake—collectors may count on winning by default. If you file an answer, it is possible that the collector will attempt to negotiate with you to avoid a lawsuit it can’t prove. If this doesn’t happen, it could be because the collector feels confident that it has the needed proof to win the case, and this may be your last chance to negotiate. Speak to an attorney or credit counselor to weigh your options. There have been many cases in which collectors go to court without actually having served the summons to the person being sued. If you learn of a default judgment against you in a lawsuit you were not notified about, you have a strong legal defense to stop any efforts to collect on the judgment. Consult a consumer attorney specializing in debt collection immediately. You have the right to bring a claim against the plaintiff (the person or company suing you)—for example, if the debt is for a product that injured you or caused damage, or if you believe the plaintiff has violated the FDCPA. (Depending on your case and/or court, you may be able to state this in your answer.) Usually you must pay a fee when you file a counterclaim. You can get general information about court rules, fees, terminology, procedures and practices from an attorney or by contacting the court clerk, but the clerk cannot give you legal advice. Learn more about responding to a debt collection lawsuit at the CFPB’s "What should I do if a creditor or debt collector sues me?" webpage; at Nolo’s “Credit Lawsuits: How the Case Begins” webpage; in Nolo’s “Represent Yourself in Court” book; and at Nolo’s “Defenses and Counterclaims to Creditor Lawsuits” webpage. Arbitration is a way of resolving disputes in which an entity outside of the court system decides the outcome of a disagreement. There is non-binding arbitration, sometimes ordered by a court, and there is binding mandatory arbitration that is required under many credit card, loan (but not mortgage) and consumer service agreements. These pre-dispute mandatory arbitration clauses require that any future disputes between the company and a consumer be heard by an arbitrator rather than by a judge in court. The arbitrator’s decision is binding, whether the consumer shows up for the hearings or not. If the debt collector takes its case against you to arbitration, you will receive a notice. As with a regular lawsuit, you should not simply ignore the deadlines and requirements outlined in the notice. If you can’t afford the arbitration fee, ask if it is possible to apply for a fee waiver. If the arbitrator’s office is far from you and you can’t afford to travel, ask if there is an option to change the hearing to a conference call or if it can be done through mail or email. Even though you don’t have to have a lawyer in arbitration, you should consult an attorney to protect your rights. During the arbitration, you and the collector each have a chance to tell your side of the story. If the arbitrator decides you owe the money, it will issue an “award” to the debt collector, who must then go to a judge and seek a court judgment. If the judgment is granted, the collector can pursue garnishment to have money taken from your paycheck or bank account. You have the right to “challenge” the award, but the time frame and your reasons for doing so are limited, so seek the advice of a lawyer. In court-ordered arbitration, the arbitrator is assigned by the court or chosen by the two sides. Fees usually are capped and may even be waived if they are unaffordable. Unlike in the mandatory “pre-dispute” arbitration hearings required by many companies, the arbitrator’s decision in court-ordered arbitration is non-binding, which means that either side can reject the decision and have the case go back before a judge. Records verifying your income and assets if you are claiming exemption from garnishment. It is possible that you will have a last-minute opportunity to try to work out a settlement or repayment plan with the collector just before the case is heard. Make sure any agreement is presented “on the record” during the hearing, and that you receive a copy of the agreement. Do not agree to any repayment plan that you aren’t sure you can fulfill. If the collector wins the case, the court will enter a judgment against you, which states how much you owe. (In the case of arbitration, the collector will take the award to a court and ask it to confirm it.) The collector has a certain number of years to collect—the exact period varies by state, as listed in an excerpt from Nolo’s "Everybody's Guide to Small Claims Court.” Most states allow creditors to renew the judgment, and some allow them to renew it over and over, essentially making the judgment permanent. Learn more about how long a judgment can last at the Nolo website. Regardless of the amount of the judgment, the law places limits on what can be taken from you. Under federal law, a creditor can only garnish 25 percent of your net wages (gross wages minus taxes and mandatory deductions) or the amount that exceeds 30 times the federal minimum wage ($7.25 per hour in 2016), whichever is less. State law may offer even greater protection. For example, in California, the lesser of 25 percent of weekly disposable earnings or 50 percent of the amount by which earnings exceed 40 times the state minimum wage ($10 per hour in 2016), or local minimum wage, if higher, is subject to levy. Typically, more of your earnings can be garnished for certain types of debt, such as taxes and spousal or child support. Learn more in AllLaw.com’s "How Much of My Wages Can Be Garnished?" That page also provides a link to Nolo’s list of state wage garnishment laws. Income from government benefits (Social Security, VA, SSI, etc.) is further protected. In some cases, it can’t be touched at all, while in other cases it could be garnished to some degree to pay certain types of debts, such as child support, alimony, student loans and delinquent taxes. Whether your government benefits can be garnished and to what extent depends on factors such as the laws of your state, the source of the benefits, how they were deposited, how much of them remains in your account and the type of debt you owe. The FTC offers a fact sheet on "Garnishing Federal Benefits," which details not only what types of government benefits are exempt, but also what to do if you receive a notice of garnishment or your bank account has been frozen. The Consumer Financial Protection Bureau offers information on the topic in "Your benefits are protected from garnishment" and "Can a debt collector take my Social Security or VA benefits?" The CFPB also offers a sample letter template you can use to tell a collector that your Social Security or VA benefits are protected from garnishment. If your bank freezes any money in your account, it must send you a notice of garnishment. Then, a judge decides whether the money should be turned over to the debt collector based on factors such as the source of your income and state law. It is very important for the judge to be aware that the source of your balance is government benefits before a decision is made regarding what should be turned over to the collector. Contact a lawyer or legal aid society for help. If you’re a senior, the Center for Elder Rights Advocacy (866-949-2372) can refer you to a local agency that provides free legal help to seniors who qualify. Be aware that even if you are entitled to notification that money in your bank account will be seized, you may not receive the notice in time to avoid bounced-check or non-sufficient funds (NSF) fees on outstanding checks. Some portion of your personal possessions and equity in a car and/or home is also exempt. Some states limit liens on homes, even if a debt collector has obtained a judgment. If a debt collector is threatening to put a lien on your home, consult an attorney to learn your rights under your state’s laws. Find information about your state’s homestead exemption (the amount of equity in your home that cannot be touched by most creditors) and other exemptions at LegalConsumer.com. Seek legal advice if your wages are garnished, funds are frozen or removed from your bank account or a lien is placed on your home. Under federal law, it is illegal for your employer to fire you because of a garnishment for a single debt. But federal law doesn’t protect you from being fired if two judgment creditors attach your wages, or if one judgment creditor attaches your wages to pay two different judgments. However, state law might offer additional protections in the case of multiple judgments. (Nolo offers state law resources that may help you determine your protections in the case of multiple judgments.) You might be able to avoid getting fired by convincing your employer that you are doing your best to clear up the debt as soon as possible. Collection agencies don't have the legal authority to issue arrest warrants or have you put in jail. However, if a collector has obtained a judgment against you, a judge could issue a warrant for your arrest if you ignore an order to appear in court or do not pay the legal fees stemming from your case, if any. In a handful of states, debt collectors are allowed to seek arrest warrants for debtors if all other collection methods have failed. (In reality, not all counties in those states enforce debt-related warrants.) To protect yourself, always show up when summoned, and seek assistance from a lawyer. If you learn of a default judgment against you in a case you were not notified about, you have a strong legal defense to stop any efforts to collect on the judgment. Consult an attorney specializing in debt collection immediately. The Legal Services Corporation (LSC), an independent non-profit established by Congress in 1974 to provide financial support for civil legal aid to low-income Americans, provides referrals to local legal aid offices for those who cannot afford a private attorney. The Center for Elder Rights Advocacy (866-949-2372) can refer consumers to a local agency that provides free legal help to seniors who qualify. Active duty servicemembers have special rights under the Servicemembers Civil Relief Act (SCRA). If you are in the military and need legal help, contact your Armed Forces Legal Assistance Office. The National Association of Consumer Advocates website (NACA) allows you to search for a qualified attorney in your area. While these attorneys’ services are not necessarily free or low-cost, an attorney might be willing to defend you pro bono (free) if he or she believes the collector is breaking state or federal law, because the collector, if it loses the case, would be responsible for paying your attorney’s fees. If you don’t qualify for free or low-cost legal help, you can contact a lawyer referral service such as your state or local bar association and ask for an attorney with experience in consumer law, debt collection defense or the Fair Debt Collection Practices Act. Or ask for referrals from people you know, including any good attorney you have hired before. Some attorneys are willing to forgo upfront payment and charge you only if and when you win your case (contingency fee arrangement) because in an FDCPA case, the court has the power to order that the debt collector pay for your attorney’s fees if you win. Nolo offers tips in “What to Do If a Bill Collector Crosses the Line." One tip is to send a copy of the FTC/CFPB complaint to the collection agency and the original creditor in hopes of getting them to cancel or negotiate the debt.